Cisco connects video and security systems, workforce mobile devices and its underlying smart grid networks. 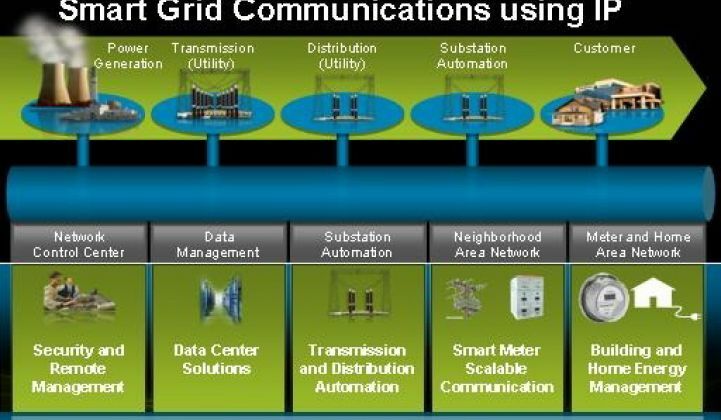 On Wednesday, Cisco launched a new suite of smart grid products that includes its first commercial-scale rollout of those kinds of concepts. It’s called the “Incident Response and Workforce Enablement solution,” and it’s essentially a real-world version of the kind of nifty, cross-media connectivity that Cisco’s been showing off in demonstrations for years now. It’s also being deployed in real utility environments, including with case study customer SCANA, a big Southeastern U.S. utility that’s been using it to bring all of its legacy radio communications and incident management platforms into one unified suite. It’s the same kind of cross-platform integration that police, fire and emergency responders have been adopting since 9/11 -- only with lots of power grid data built in as well. Indeed, Cisco is pulling from a lot of its experience and technology in other industries to inform its new utility incident and workforce offering, David Goddard, vice president of Cisco’s Connected Energy Solutions, said in an interview. Utilities have plenty of technology in place to link up distribution automation (DA) gear like sensors and self-healing grid switches, and many have mobile workforce radio networks, video surveillance and physical security systems of one kind or another deployed, he noted. Cisco’s new platform ties all of these together, he said. On one end, Cisco’s “situation manager” device links up SCADA systems, outage management systems (OMS) and customer information in one platform. On the other end, Cisco’s IPICS, or “IP interoperability and collaboration system,” translates all that multi-technology data, video and audio into Internet Protocol, for use across any other devices that’s hooked up to it, he said. “The incorporation of video is absolutely key,” he added. Cisco’s new system integrates it all in ways that allows video from multiple sources to be shared across the system, whether for the many different people who might find it useful, or for digital video analysis that can alert operators when an automated video feed catches something untoward happening -- say, a bright flash, or an open doorway. Wednesday also saw Cisco expand its grid architecture and network integration services via the launch of two new “solutions” to the market. The first, Cisco’s Utility Operational Network Solution, includes architecture, design services and products for utility wide area networks, and has been used by showcase customers such as State Grid Corp. of China, the world’s biggest utility and biggest single smart grid investor. The second is Cisco’s Connected Grid Design Suite -- a set of hardware, software and services to help customers manage the complexity of new technology integration in substations. That’s built on Cisco’s “GridBlocks” architecture, which is aimed at bringing all the legacy technology in a substation into a single view, so that the increasingly complex tangle of new technologies being added to the grid can interact with it. Cisco has emerged as a major player in the smart grid networking and communications field, but it’s far from the only one. Networking rivals such as Alcatel-Lucent and Juniper Networks are big contenders, as is Canadian company RuggedCom, which was bought by Siemens for $381 million last year. GTM Research predicts that the U.S. distribution automation communications market will add up to between $600 million and $1.8 billion over the next four years, and Europe, China, Japan and Korea are also big markets for DA comms. At the same time, Cisco has been branching into smart meter integration via partners like Itron and Elster, substation automation via partners like Alstom, and a long list of other hardware and software partners. At the same time, it’s linking up other networks, like “smart” parking sensors from startup Streetline, and home area networking in its recently announced partnership with Verizon -- though these aren’t specifically connected to Cisco’s smart grid efforts as of yet.